Atlas Games: ENnies Voting is Live! Feng Shui 2 Nominated in Five Categories! ENnies Voting is Live! 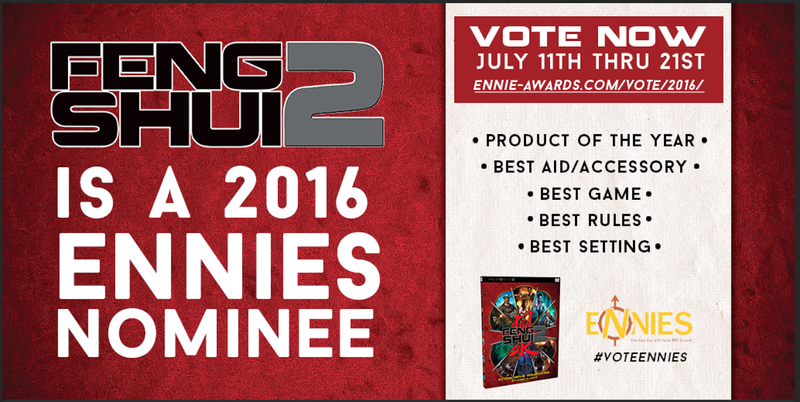 Feng Shui 2 Nominated in Five Categories! 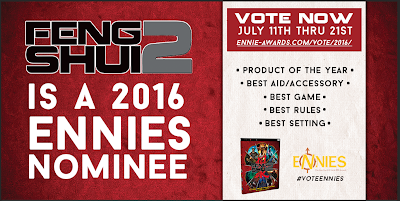 And if you're a Feng Shui 2 fan, don't hesitate to have your voice heard by joining in the ENnies voting. No sign up or registration is required, just click the link and cast your vote! Congratulations and good luck to all of our co-nominees. It's a pleasure and a privilege to be among such esteemed company! * If the sale prices aren't reflected at one of these sites when you arrive there, that's because in our excitement, we jumped the gun a little bit with this post. The discounted price is in the process of being rolled out and will be available shortly.